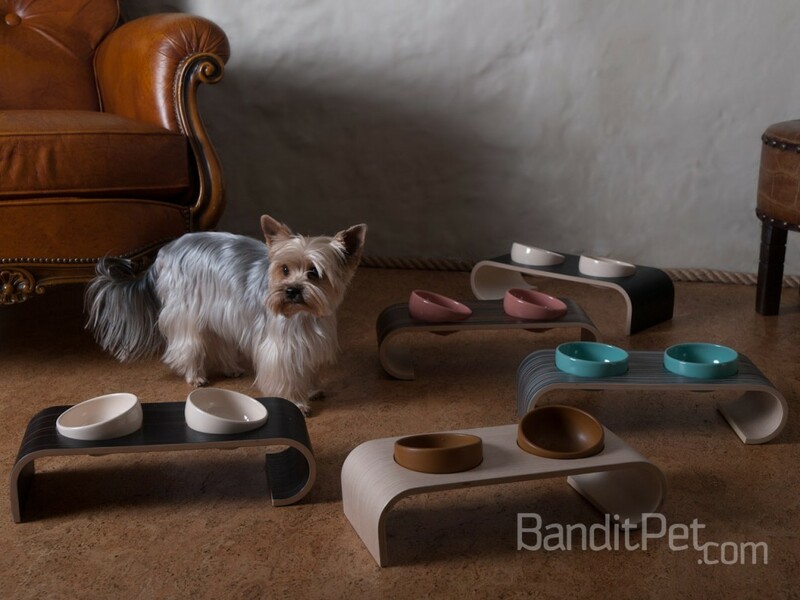 Pet Uniq is a UK distributor of the BanditPet range which is a beautiful and contemporary range of elevated, veneer dog and cat feeders. The company was founded by Jim and Angela McCreadie who are life-long dog lovers. 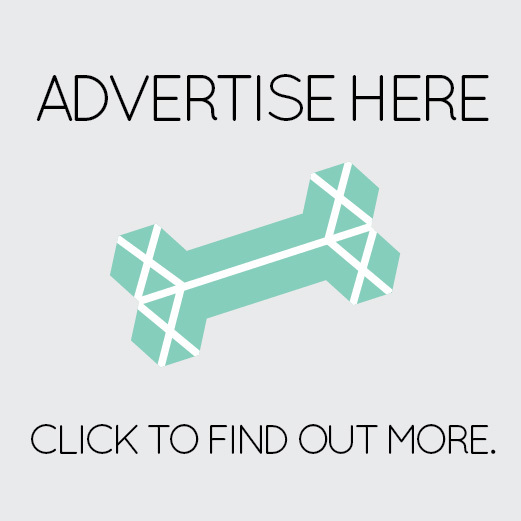 They also run the most luxurious pet hotel in Scotland, called Clyde Valley Pet Retreat. 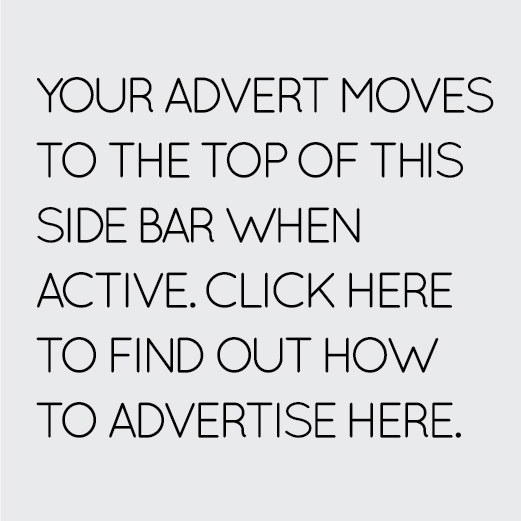 So they are certainly qualified to choose only the best very products for your pets. Jim Believes that BanditPet shares his high standard and it compliments his pet spa hotel business perfectly. 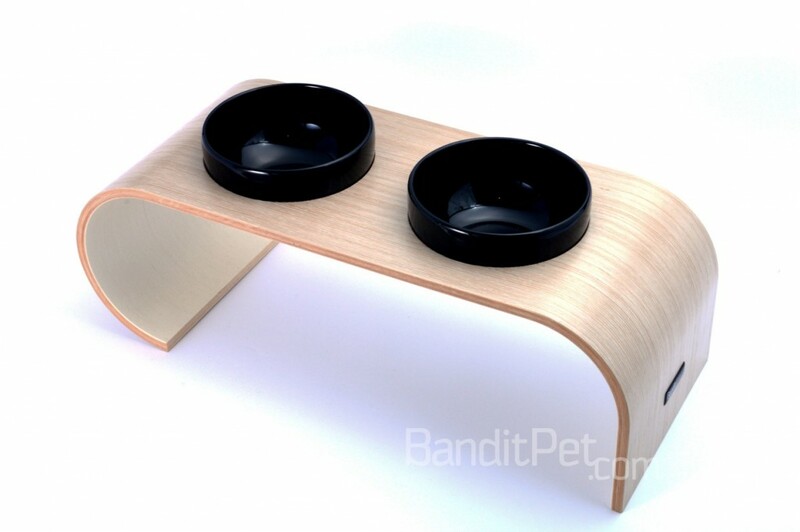 BanditPet elevated, veneer feeders are made from six layers of top-quality birch wood. 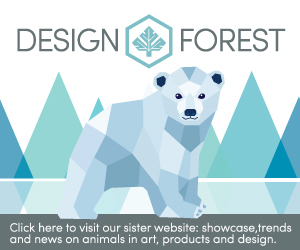 The top and bottom of the feeder can be finished with beautiful, luxury wood veneers of white oak, ebony, Maccasar or Zebrano, to create diverse styles to suit different interiors. The unit has two coats of varnish so it’s moisture resistant and also made it easy to clean with a damp cloth. 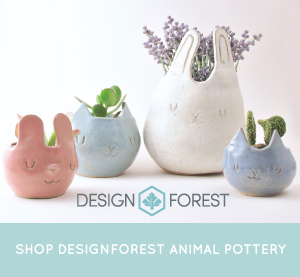 The ceramic bowls are also microwave and dishwasher safe, making them easy to clean and maintain, which is really important for to keep your pet feeder hygienic. 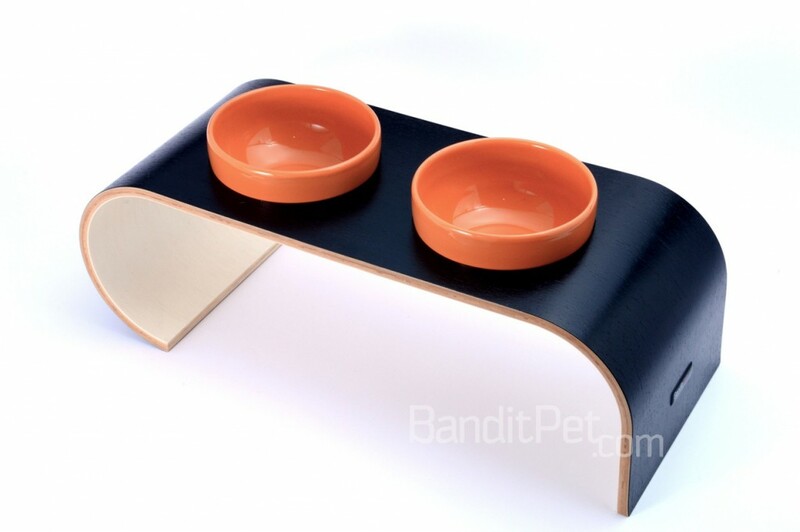 Another great feature of the BanditPet feeder is that the ceramic bowls will stay in place because of the slightly angled openings of the feeder and also due to silicone pads around the inner edges of the openings. 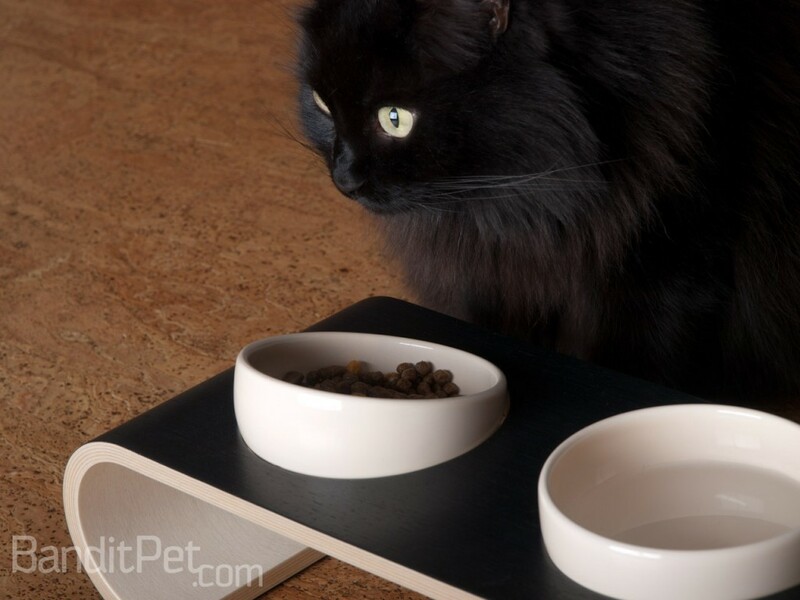 That means the bowls can be used at an angle or lying flat on the feeder to make sure your pets have a comfortable dining experience. The bowls are available in two sizes: small and medium. 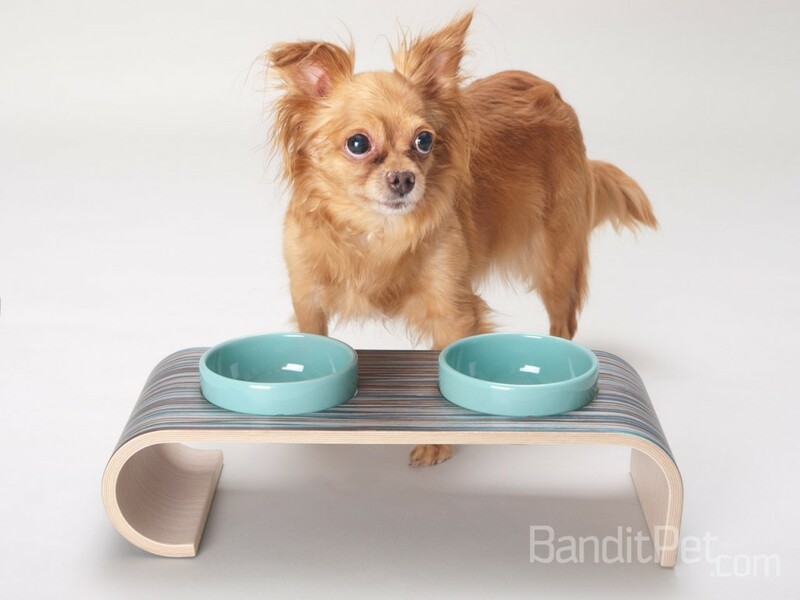 The San Francisco elevated dog and cat feeders were inspired by the unique and breathtakingly diverse city of San Francisco. 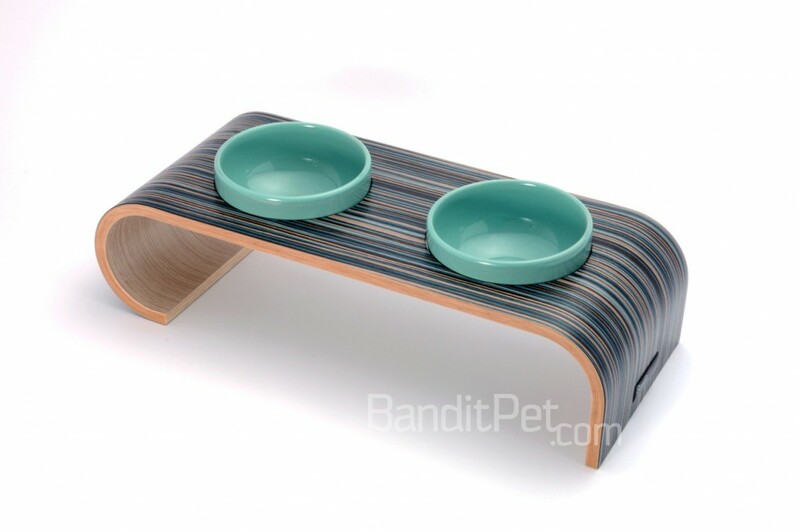 The top layer of the feeder is made from a colored natural veneer. Its fine and colorful lines characterize the exciting diversity of city life and the true joy of life. Within its colors you can find the blue of ocean, the sun of California and the mist that arises when the two meet and so typical to the city of hills. 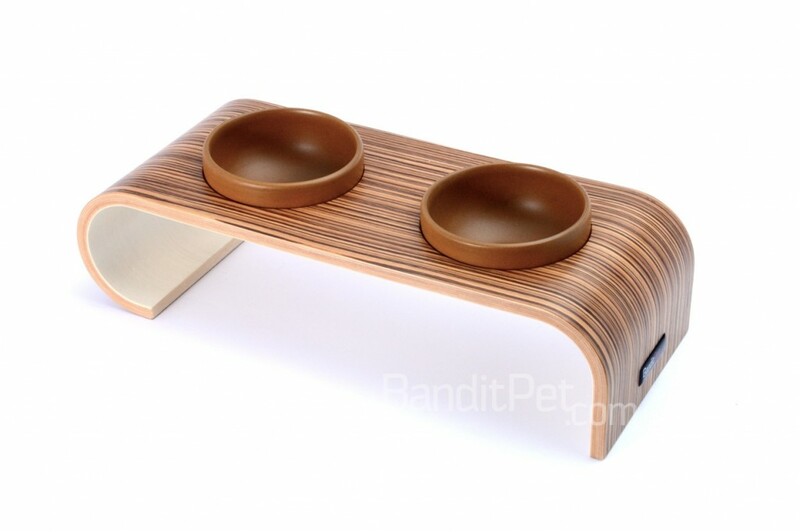 A balancing oak veneer has been used for the bottom layer of the feeder. The Nairobi feeder is inspired by the exotic nature of Africa. For the top layer of the feeder we have used an Ebony veneer which is an intensely black wood. The combination of its very high density, fine texture and very smooth finish when polished, has made it a very valuable wood. 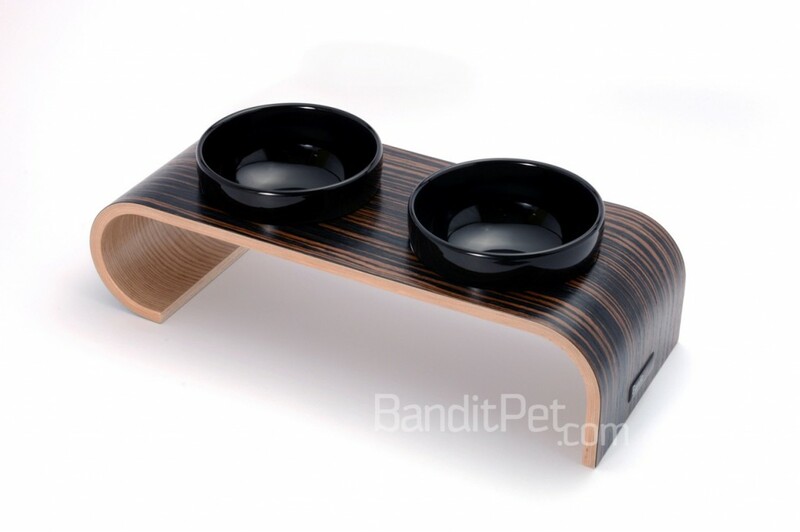 Ebony veneer is also used as the bottom layer of the feeder. 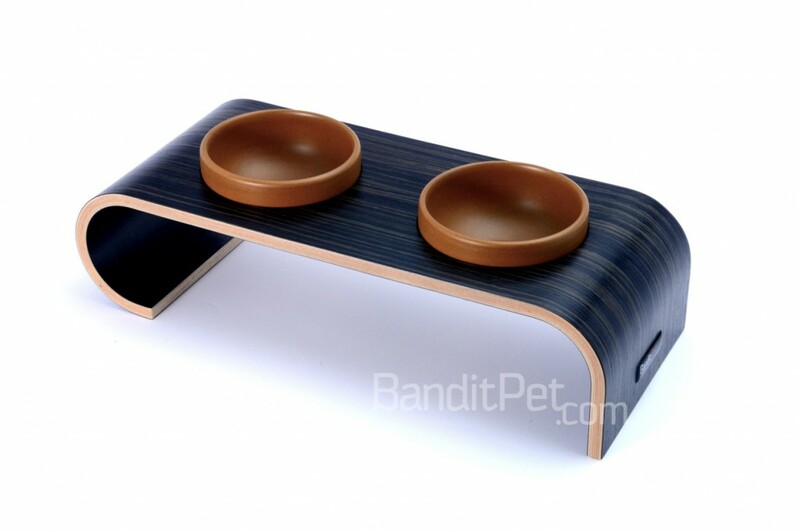 The Havanna elevated dog and cat feeders were inspired by the relaxed Cuban temperament. A midnight walk under a starry sky and rich aromas of Cuban rum and Cuban cigars. A vacation one can never forget. The Jakarta feeder was inspired by the lush diversity of Jakarta’s tropical climate. 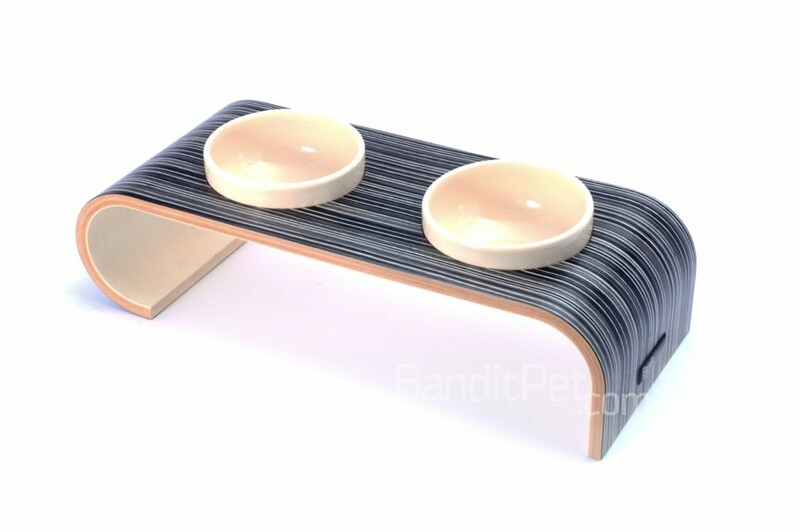 For the top layer of the feeder we have used a Makassar wood veneer which mainly grows in Indonesia. Makassar wood is known for its density but its also valued for its amazing striped pattern of real blacks and dark chocolate browns. It has an irresistable draw for those in the know. For the bottom layer of the feeder a compensatory oak veneer has been used. 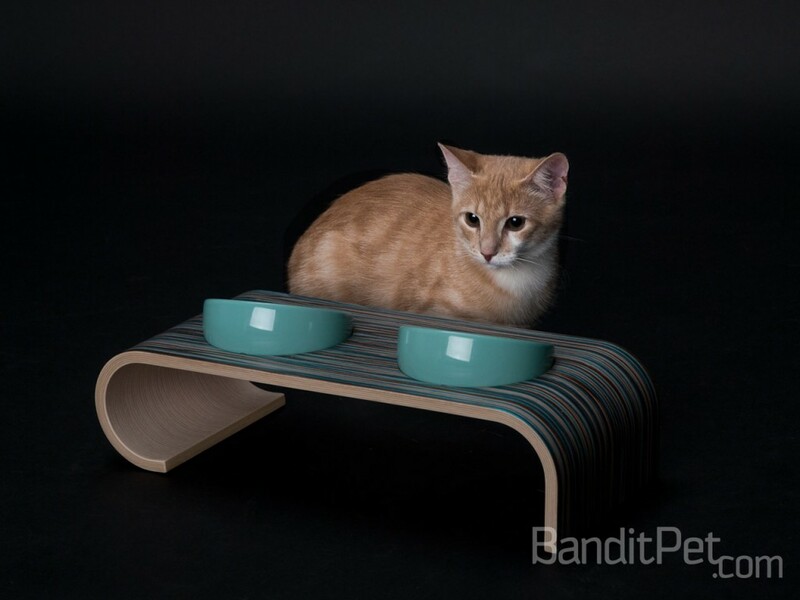 The New York elevated dog and cat feeders were inspired by a city of contrasts. The classy black and white smart suits of Manhattan, therelaxing piano bars, the fluffy milky foam on morning coffee, rushing streets and lights that never go out in city that never sleeps. For the bottom layer of the feeder, white oak veneer has been used. 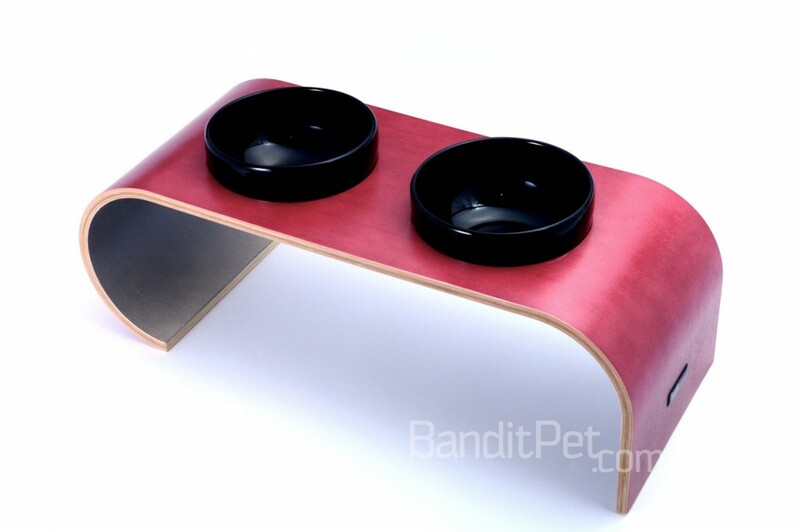 The Paris elevated dog and cat feeders were inspired by the city of love and romance. A romantic sunset, fluttering hearts, blushing pink cheeks of people who just fallen in love and those moments of joy and new beginnings. The Paris feeder is made from a coloured natural veneer and the bottom layer of the feeder is finished with a balancing oak veneer. The Stockholm elevated dog and cat feeders were inspired by the crisp northern natural environment, snowy slopes and fair-haired people. The top layer of the Stockholm feeder is white oak veneer with beautiful brown and white stripes. The lines are delicate and straight, giving the feeder a calm but very special clean and crisp appearance. The bottom layer is finished using a birch veneer which is very common in northern climate. The Sydney elevated feeder has been inspired by the wonderful colors of Australian nature. 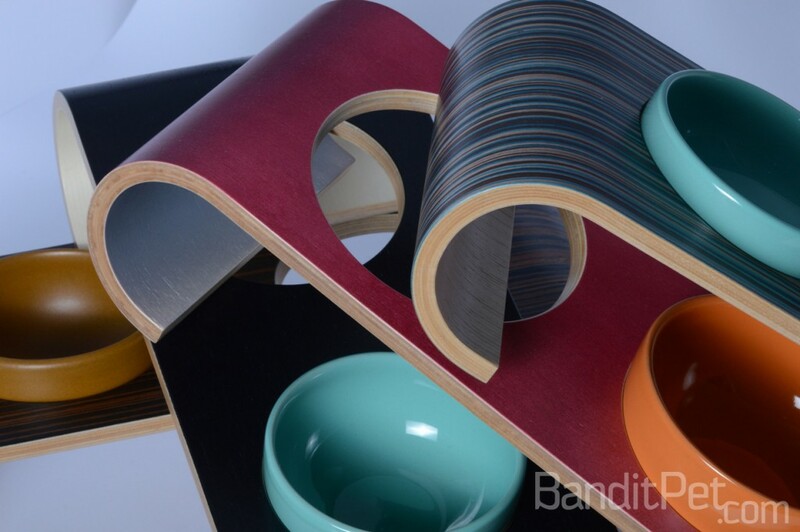 For the top layer of the feeder we have used a lush Zebrano veneer which has a rich variety of sandy colors representing sunny beaches and deep shades of the Australian outback. White oak veneer is used as a contrast for bottom layer of the feeder. 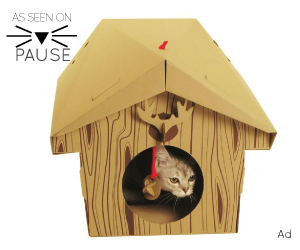 The Tokyo elevated dog and cat feeders were inspired by the minimalism of the land of rising sun. The top of the Tokyo feeder is finished with a deep, luxurious black oak veneer which is a style statement in itself and it will compliment even the most modern of home décor. To compliment the dark top veneer a white oak veneer has been used for the bottom layer. 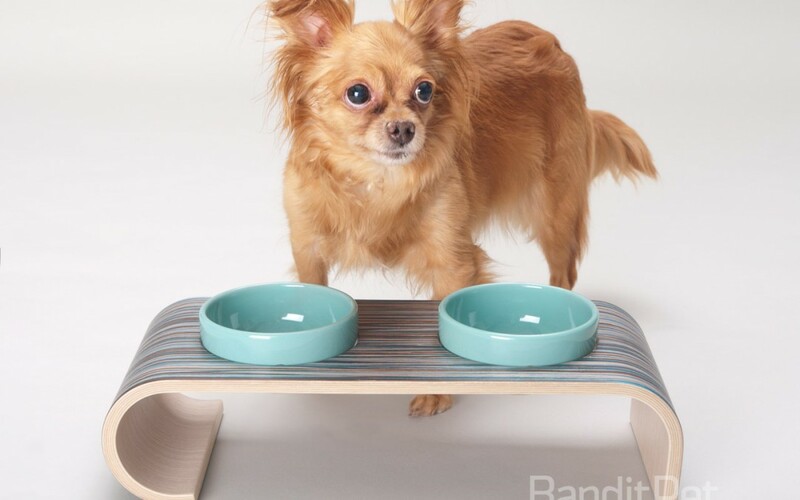 Pet Uniq’s BanditPet Feeders are not only beautiful and high-quality but also well-designed, practical and easy to maintain, allowing a more enjoyable dining experience for your pets. Visit Pet Uniq.